We cannot allow indifference or silence to normalize the language of intolerance in political discourse. I, for one, do not want the next generation of politicians to have to apologize for injustices that I have the ability to prevent. Not long after I was elected to Parliament, I attended the unveiling of a commemorative plaque acknowledging the internment of Ukrainian Canadians during the First World War. Despite coming to Canada to help build our country, they were considered to be "enemy aliens" and thousands were interned in camps across the country. Just before the war, a ship had sailed into harbour in Vancouver with hundreds of passengers seeking a new life in Canada. Despite the fact that the primarily Sikh passengers were all British subjects, the Komagata Maru was turned away and its passengers had to make the long journey home to face imprisonment and even death. A generation later, another ship was refused passage into Halifax in the months before the outbreak of the Second World War. The MS St. Louis was filled with 900 Jews seeking refuge from the Nazi persecutions and had attempted unsuccessfully to flee to Cuba and the United States. They were denied safe haven in Canada in what was the start of the unofficial "None is Too Many" policy towards Jewish immigration. They were forced to return to Europe and, tragically, a quarter of the passengers died in the death camps. Much like in the previous war, Canada once again declared some of our people to be "enemy aliens" because of their ancestry. Thousands of Japanese Canadians were interned and many had their property seized because of fear, uneasiness and prejudice in our country at that time. Canada has not always lived up to its promise as a free, fair and pluralistic society. From No Irish Need Apply signs, to the Chinese Head Tax, to the slurs that met generations of Dutch, Italian and Eastern European immigrants, Canada has not always lived up to its promise as a free, fair and pluralistic society. As each wave of immigration came to our shores, it also brought uneasiness and, in some cases, intolerance. In the last few decades, Canadian prime ministers -- from Brian Mulroney to Justin Trudeau -- have apologized for these past transgressions. Our west and east coasts that once turned away ships seeking refuge are now adorned with monuments to commemorate those ships and the tragedies they represent in our history. These formal apologies, symbolic gestures and commemorative markers across the country are intended to show that we have learned from our past. The terror attack at the Quebec City area mosque that killed innocent people engaged in prayer is one of the most despicable crimes our country has ever seen. Innocent people praying to their God, apparently struck down because of who they were. It was perpetrated by a person filled with ignorance and hate -- and when his hate erupted into violence, it tore through families, a community and our country. While this extreme act is isolated and must be viewed as such, I don't think any serious observer could not acknowledge the undercurrents of intolerance that have bubbled below the surface in recent months and years. Despite our decades of apologizing for the past and despite erecting monuments to show we have learned these lessons, we are collectively allowing another wave of immigrants to face the same uneasiness and intolerance like others before them. This time, they are from the Middle East and North Africa, and primarily from the Muslim faith. We cannot allow indifference or silence to normalize the language of intolerance in political discourse. Thankfully the state can no longer deem someone an "enemy alien" because of their ancestry or beliefs, but one glance at social media shows that this label is being applied to them anyway through the growing language of intolerance online. I have tried to counter some of this uneasiness or intolerance myself in my role as an MP, but I don't think I have been doing enough. I pledge to be forceful in my role as a public figure. I also believe that it is incumbent on all public leaders to adopt the same approach when it comes to some of the intolerance we see online. You can defend Canadian interests and be strong on issues like defence, security, immigration and foreign affairs, while also showing zero tolerance for intolerance. 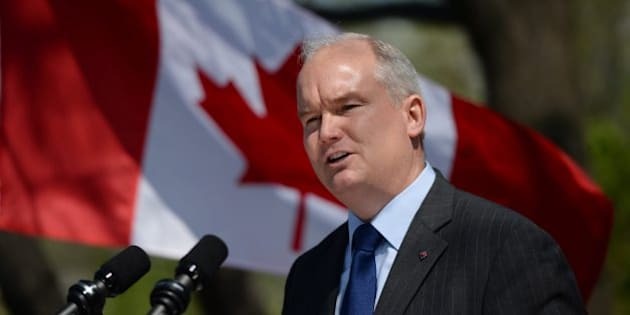 The Honourable Erin O'Toole is the Member of Parliament for Durham, the former Minister of Veterans Affairs, a retired RCAF Captain, and a candidate for Leader of the Conservative Party of Canada.